The CLX™ series front-end loader is Challenge Implements advanced front-end loader range offering many standard and optional features that save farmers operational time and effort. A great match for agricultural tractors with 50 to 340 horsepower, we have coupled this range with hundreds of tractor models of varying brands. Available Challenge loader kits for Case IH tractors; Case IH 3200 range, Case IH 4200 range, Case IH CX range, Case IH Farmall C range, Case IH Farmall JX range, Case IH Farmall JXM range, Case IH Farmall U range, Case IH JX range, Case IH JX Straddlemount range, Case IH JXU range, Case IH Magnum 7000 range, Case IH Magnum 8900 range, Case IH Magnum Tier 4 range, Case IH Maxxum range, Case IH Maxxum 5000 range, Case IH Maxxum Tier 4 CVT range, Case IH MX Magnum range, Case IH MX Maxxum range, Case IH MX-C range, Case IH MXM range, Case IH MXU range, Case IH Puma range. Available Challenge loader kits for New Holland tractors; New Holland 8060 range, New Holland T4 Dual Command range, New Holland T4 Powerstar range, New Holland T4000 range, New Holland T5 range, New Holland T5000 range, New Holland T6 range, New Holland T6000 range, New Holland T7 Tier 4A range, New Holland T7 Tier 4B range, New Holland T7000 range, New Holland T8 range, New Holland T8000 range, New Holland TD5 range, New Holland TDD range, New Holland TG range, New Holland TLA range, New Holland TM range, New Holland TNS range, New Holland TS range, New Holland TSA range, New Holland TT4 range. Available Challenge loader kits for John Deere tractors; John Deere 1600 range, John Deere 2000 range, John Deere 3050 range, John Deere 4040 range, John Deere 4050 range, John Deere 4055 range, John Deere 4060 range, John Deere 5000 range, John Deere 5010 range, John Deere 5003 range, John Deere 5020 range, John Deere 5025 range, John Deere 5E range, John Deere 5M range, John Deere 5R range, John Deere 6000 range, John Deere 6010 range, John Deere 6020 range, John Deere 6030 range, John Deere 6D range, John Deere 6M range, John Deere 6MC range, John Deere 6R range, John Deere 6R Tier 4 range, John Deere 6RC range, John Deere 7000 range, John Deere 7010 range, John Deere 7020 range, John Deere 7030 range, John Deere 7R range, John Deere 8000 range, John Deere 8R range. There are more tractor ranges available for our Challenge CLX™ series front-end loader. Contact us to see if we can fit a front-end loader to your tractor model. Enhances the strength of the front-end loader without compromising on visibility. With the development of the patented EES™ system, the Challenge CLX™ front-end loader has greater strength while also allowing the entry and exit points of the hydraulic hoses and wiring harness. One of the main areas of any front-end loader that needs extra strength is the cross bar that joins the two boom arms together. The EES™ cross bar system offers an added total of a 56% increase in cross bar re-enforcement, allowing a total of six high-penetration welds from the boom points that protects and guides the hoses and wiring within the loader boom arm. These castings have been designed to offer maximum strength to the surrounding area of the hydraulic hose entry and exit points. Self-leveling and providing a clean, concealed approach to ensure improved visibility. As a world-first, Challenge Implements developed the patent pending CLT™ front-end loader levelling system with an innovative internal self-levelling linkage enclosed inside the loader boom. With years of development, Challenge is able to conceal the linkage inside the boom arm which gives the front-end loader a better appearance and gains increased vision. This makes for a streamlined and compact front-end loader, while continuing to offer safety to the operator with the use of advanced level-lifting technology. With the combined EES™, CLT™ and more, this front-end loader provides great vision and style. With the use of EES™ and CLT™ technology, Challenge Implements has been able to conceal the level lift linkage inside the boom arm giving the CLX™ front-end loader a cleaner, more compact appearance and gains between 240mm and 260mm of increased vision. Flush pin design and hidden hydraulic hoses increases loader to tractor clearances and provides clean boom arm surfaces free from hoses, brackets, fittings and other components traditionally mounted on the boom arm surface. The implement level gauge has been made from solid steel bars and a welded cast steel bracket to ensure the strength of this feature. The level gauge is mounted on the inside of the front-end loader below the level of the frame arm for ease of sight and protection. 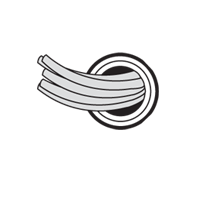 The registered cross bar cover design is made with a heavy duty high-density polyethylene material, protecting hoses and valving mounted underneath the cover. This stylish cover is designed to maximise operator vision. Vision and style is further maximised with the use of high-gauge 40mm pins, industrial self lubricating bearings, and cast levelling crank allowing a hidden compact levelling system. The operator can fold and lock the frame stands automatically when attaching the front-end loader. Using the front-end loader dump function on the Challenge CLX™; the operator can fold and lock the frame stands automatically enabling the operator to continue working after attaching the front-end loader. This patent pending Fast Lock frame stand fastening system only takes seconds saving the operator ample time and effort. 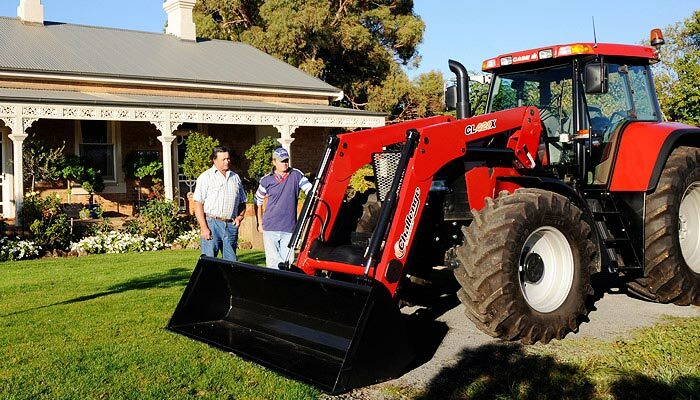 The operator can completely attach and secure the front-end loader without leaving the tractor seat. Automatically lock and tighten the CLX™ front-end loader to the tractor subframe with the patent pending Auto Cam Lock system. Re-attaching the front-end loader is a very quick, automated process. 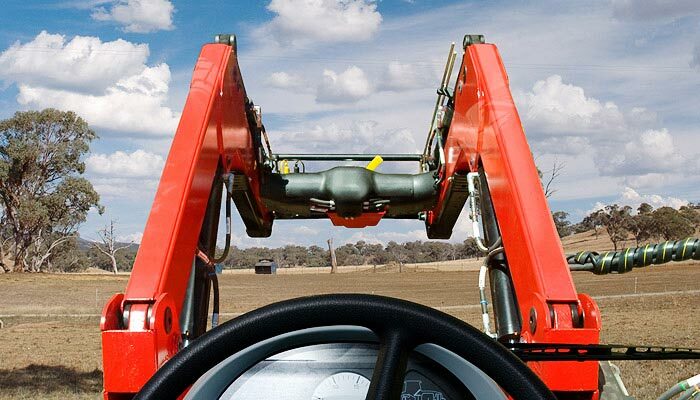 Once the hydraulic hoses have been connected, the operator can completely attach and secure the front-end loader without leaving the tractor seat. Remotely operate an additional hydraulic circuit. Comes standard with the Challenge CLX™. The electric 3rd function allows the operator to remotely operate an additional hydraulic circuit on an attachment. This is controlled by the operator from a switch mounted on the joystick. Electric 3rd service comes standard with the Challenge CLX™ front-end loaders. Choice of a Australian-style hitch system to match your Australia-style attachments. The Aus hitch quick coupler is a specifically designed attachment system used for coupling all attachments, using the Aus Hitch system, quickly and efficiently. The quick coupler uses a single lever action to disengage the locking pins from the attachment and has a spring return auto lock function when reattaching to an attachment. The Aus Hitch is designed with much larger and stronger locking pins in comparison to the Euro hitch system. Choice of a European-style hitch system to match your European-style attachments. The Euro hitch quick coupler has been developed to allow those customers, who may have previously purchased European-style attachments that suit some of the European-manufactured loaders, the ability to retain those attachments and use them on their Challenge front-end loader. The quick coupler uses a single lever action to disengage the locking pins from the attachment and has a spring return auto lock function when reattaching to an implement. The Challenge CLX™ series has a number of optional accessories that improve the time and effort required to do the job and increases the comfort in operating the front-end loader. Remotely operate an additional hydraulic circuit on top of your pre-existing electic third service. Along with the included electric third service, an optional electric fourth service is available to be fitted at the time the front-end loader is ordered. It can also be purchased as an after-market fitment, with standard couplings or an easy-to-use multi-coupling system. The electric third and fourth services are activated conveniently from the front-end loader joystick. Make it easier to change hydraulics. Ideal for customers who change between attachments often. The use of multi-couplers increases operator ease-of-use when changing electric third and fourth service dependent implements from quick couplers. There are also multi-couplers available for easier hydraulic coupling of the front-end loader, on and off the host tractor. Attach/detach front-end loader attachments from the confort of your tractor seat. The Challenge CLX™ quick coupler has been designed to allow maximum vision when attaching implements to the quick coupler. 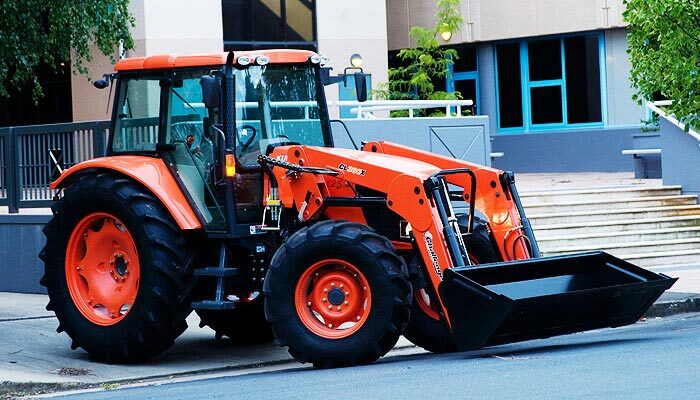 With the carefully designed Easy Lock system fitted to your Challenge CLX™ front-end loader, you never need to manually attach an implement to your front-end loader again. Enjoy the smoothest ride possible with the Hydro Ride system. Travelling with or without a load, the Hydro Ride system will sense and adjust to the current load being carried. While travelling from point A to B, you can enjoy the smoothest ride possible with this system. The Hydro Ride system can be turned on or off from the tractor console, making it convenient when loading and stacking where more precision is needed. [Note 1] Vertical distance from ground line to lowest point of cutting edge when bucket is dumped 45° and loader is fully raised. [Note 2] Horizontal distance from tip of bucket cutting edge to centre line of tractor front wheels with loader fully-raised and bucket dumped at 45°. [Note 3] Horizontal distance from tip of bucket cutting edge to centre line of tractor front wheels with bucket level on ground. [Note 4] Digging depth can vary depending on fitted tractor tyre equipment. [Disclaimer] Loader specifications may vary with tractor models, tyre sizes and/or hydraulic systems, and assume a hydraulic system capacity of 15.0 Mpa. To correctly ballast the tractor when used with a front-end loader, a three-point linkage counterweight must be fitted. Also refer to the tractor operators manual for weighting and ballasting information.